For the class of neurons characterized by a large spindle-shaped body, see Spindle neuron. Muscle spindles are sensory receptors within the belly of a muscle that primarily detect changes in the length of this muscle. They convey length information to the central nervous system via sensory neurons. This information can be processed by the brain to determine the position of body parts. The responses of muscle spindles to changes in length also play an important role in regulating the contraction of muscles, by activating motor neurons via the stretch reflex to resist muscle stretch. 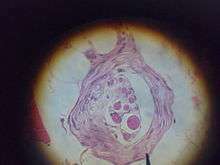 Light microscope photograph of a muscle spindle. HE stain. nuclear chain fibers and the axons of sensory neurons. Axons of gamma motoneurons also terminate in muscle spindles; they make synapses at either or both of the ends of the intrafusal muscle fibers and regulate the sensitivity of the sensory afferents, which are located in the non-contractile central (equatorial) region. Muscle spindles are encapsulated by connective tissue, and are aligned parallel to extrafusal muscle fibers, unlike Golgi tendon organs, which are oriented in series. The muscle spindle has both sensory and motor components. Primary and secondary sensory nerve fibers spiral around and terminate on the central portions of the intrafusal muscle fibers, providing the sensory component of the structure via stretch-sensitive ion-channels of the axons. In mammals including humans, the motor component is provided by up to a dozen gamma motoneurons and to a lesser extent by one or two beta motoneurons. Gamma and beta motoneurons are called fusimotor neurons, because they activate the intrafusal muscle fibers. Gamma motoneurons innervate only intrafusal muscle fibers, whereas beta motoneurons innervate both extrafusal and intrafusal muscle fibers and so are referred to as skeletofusimotor neurons. 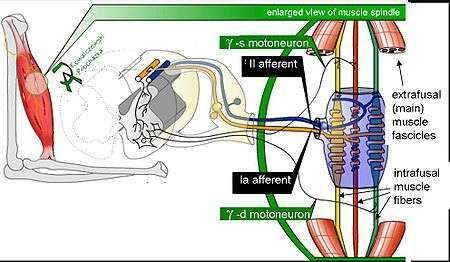 Fusimotor drive causes a contraction and stiffening of the end portions of the intrafusal muscle fibers. Fusimotor neurons are classified as static or dynamic according to the type of intrafusal muscle fibers they innervate and their physiological effects on the responses of the Ia and II sensory neurons innervating the central, non-contractile part of the muscle spindle. The static axons innervate the chain or bag2 fibers. They increase the firing rate of Ia and II afferents at a given muscle length (see schematic of fusimotor action below). The dynamic axons innervate the bag1 intrafusal muscle fibers. They increase the stretch-sensitivity of the Ia afferents by stiffening the bag1 intrafusal fibers. How does the central nervous system control gamma fusimotor neurons? It has been difficult to record from gamma motoneurons during normal movement because they have very small axons. Several theories have been proposed, based on recordings from spindle afferents. 1) Alpha-gamma coactivation. Here it is posited that gamma motoneurons are activated in parallel with alpha motoneurons to maintain the firing of spindle afferents when the extrafusal muscles shorten. 2) Fusimotor set: Gamma motoneurons are activated according to the novelty or difficulty of a task. Whereas static gamma motoneurons are continuously active during routine movements such as locomotion, dynamic gamma motoneoruns tend to be activated more during difficult tasks, increasing Ia stretch-sensitivity. 3) Fusimotor template of intended movement. Static gamma activity is a "temporal template" of the expected shortening and lengthening of the receptor-bearing muscle. Dynamic gamma activity turns on and off abruptly, sensitizing spindle afferents to the onset of muscle lengthening and departures from the intended movement trajectory. When a muscle is stretched, primary sensory fibers (Group Ia afferent neurons) of the muscle spindle respond to both changes in muscle length and velocity and transmit this activity to the spinal cord in the form of changes in the rate of action potentials. Likewise, secondary sensory fibers (Group II afferent neurons) respond to muscle length changes (but with a smaller velocity-sensitive component) and transmit this signal to the spinal cord. The Ia afferent signals are transmitted monosynaptically to many alpha motor neurons of the receptor-bearing muscle. The reflexly evoked activity in the alpha motoneurons is then transmitted via their efferent axons to the extrafusal fibers of the muscle, which generate force and thereby resist the stretch. The Ia afferent signal is also transmitted polysynaptically through interneurons (Ia inhibitory interneurons), which inhibit alpha motoneurons of antagonist muscles, causing them to relax. After stroke or spinal cord injury in humans, spastic hypertonus ( spastic paralysis) often develops, whereby the stretch reflex in flexor muscles of the arms and extensor muscles of the legs is overly sensitive. This results in abnormal postures, stiffness and contractures. Hypertonus (Hypertonia) may be the result of over-sensitivity of alpha motoneurons and interneurons to the Ia and II afferent signals. PNF stretching, or proprioceptive neuromuscular facilitation, is a method of flexibility training that can reduce hypertonus, allowing muscles to relax and lengthen. It is also believed that muscle spindles play a critical role in sensorimotor development. ↑ Hulliger M (1984). "The mammalian muscle spindle and its central control". Rev. Physiol. Biochem. Pharmacol. 101: 1–110. doi:10.1007/bfb0027694. PMID 6240757. ↑ Vallbo AB, al-Falahe NA (February 1990). "Human muscle spindle response in a motor learning task". J. Physiol. (Lond.). 421: 553–68. doi:10.1113/jphysiol.1990.sp017961. PMC 1190101 . PMID 2140862. ↑ Prochazka, A. (1996). "Proprioceptive feedback and movement regulation". In Rowell, L.; Sheperd, J.T. Exercise: Regulation and Integration of Multiple Systems. Handbook of physiology. New York: American Physiological Society. pp. 89–127. ISBN 0195091744. ↑ Taylor A, Durbaba R, Ellaway PH, Rawlinson S (March 2006). "Static and dynamic gamma-motor output to ankle flexor muscles during locomotion in the decerebrate cat". J. Physiol. (Lond.). 571 (Pt 3): 711–23. doi:10.1113/jphysiol.2005.101634. PMC 1805796 . PMID 16423858. ↑ Heckmann CJ, Gorassini MA, Bennett DJ (February 2005). "Persistent inward currents in motoneuron dendrites: implications for motor output". Muscle Nerve. 31 (2): 135–56. doi:10.1002/mus.20261. PMID 15736297.